The best video game movie ever? Does it break the video game movie curse? According to some, absolutely. You may want hold to fire on declaring this the best video game movie – as the rest of the reactions range from the monster movie being big, dumb fun to being ridiculous. Which, as we all know, is code for an enjoyable, but ultimately forgettable flick. Read on for all of the major reactions: the good, the bad, and the monkey. There you have it. 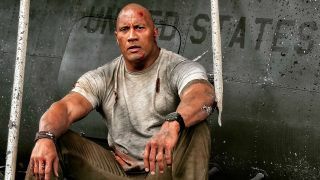 The general consensus is that The Rock, yet again, has knocked it out of the park and is cementing himself as the most marketable name in Hollywood. Big gorillas and smashing up skyscrapers shouldn’t work anymore; Dwayne Johnson’s presence says otherwise. While Avengers: Infinity War casts a looming shadow over the next few months, it appears that Rampage has cornered the market for those wanting something a little different, harkening back to a time filled with fewer Infinity Stones and more monkeys going bananas. It’s also great to hear Jeffrey Dean Morgan break off his Negan shackles by, uhh, playing a charismatic villain who oozes charm and menace. Hey, at least he didn’t bring his baseball bat along for the ride this time. We think. The Rock is continuing to grow away from the wrestling ring, but what about others who walkedthe same path? Here are the 10 best wrestlers-turned-actors.